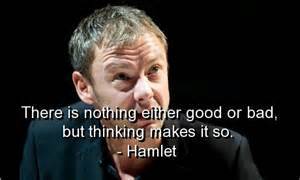 Logical Gal says beware of thinking like Hamlet! One can argue, with good reason, that how we think about something or ‘frame’ something DOES make a difference in our experience. 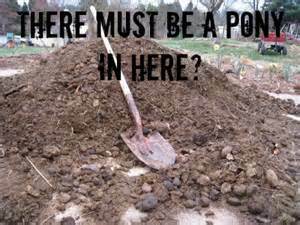 I’ve heard the illustration of 2 boys mucking out a stable full of horse manure. To the one who ‘thinks’ this is just a punishing task, his labor is odious. But to the one who ‘thinks’ or reasons from the product to the producer, he is excited about encountering a pony! Thus, this time in the barn is an adventure sure to result in a happy outcome. But let’s be real! There ARE objective values in life. There is ‘good’ and ‘evil’ and no effort to think otherwise will change their ontology or ‘beingness’. Torturing little children or animals for the fun of it is always WRONG! And that assessment is cross-cultural, cross-temporal. That is not to say that kids and animals are not harmed in our world today. When that happens, most everyone reacts along a spectrum from horror to resignation. Whether we draw examples from so-called ‘pagan’ cultures that have in the past or still do sacrifice kids and animals today (Voodooism) OR we point to abortion as a ‘civilized’ example – to say that these practices are for FUN would be labelled WRONG. They would be rationally justified. try laying your philosophy of calm resignation on the millions who suffer daily from disasters brought on by the ravages of nature, war or man’s inhumanity to man! Our takeaway for the day? Keep questioning ‘pat’ sayings to determine if they are so – even those from the Bard, himself! Question: What other truism is worth examining?